Christmas is just around the corner, and if you haven’t decorated your home, we’re here to the rescue! It’s not a surprise that the holiday cheer is all around us, and spreading this festivity at home will only heighten our spirit. 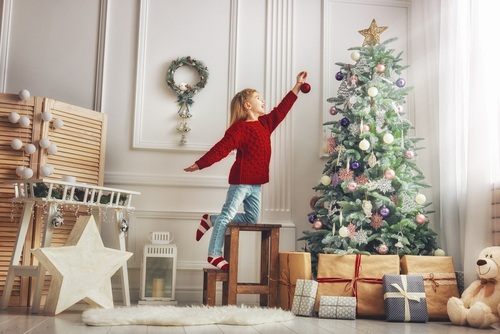 We’re pretty sure that everywhere you look, you see entryways adorned with lovely wreaths and Christmas trees carefully decorated with ornaments. Even the street lamps are filled with red bows and ribbons while the trees are with Christmas lights. With all the decorations, it can be easy to get overwhelmed. The following are ways you can decorate your home just in time for the holidays. One of the best ways to save space is by replacing your existing decors with seasonal ones. For example, some people have a bowl of faux flowers on their coffee table. During the holidays, they replace them with seasonal accents like holly branches, dreidels, jingle bells, or pinecones. You know those neutral candles you have around the home, you can exchange them for holiday-themed ones. You can also replace throw blankets, pillows, and prints with something that says Christmas all over it. Seasonal textiles are also popular to replace during the holidays such as door mats, hand towels, and tablecloths. Also, if you’re feeling like doing some DIY projects, you can replace existing photos with festive fabric or holiday greeting cards. For some of you who have issues with space, try getting creative. For example, apartments can’t necessarily accommodate to a 7-foot Christmas tree. Instead, try buying a smaller tree. Alternatively, you can use push pins to hang some string lights on the ceiling to heighten your holiday cheer. You can also adhere some decals around the window with Santa Claus, reindeers, and more.